The UK Centre for Tobacco and Alcohol Studies (UKCTAS) has produced a devastating critique of the WHO paper on ‘Electronic Nicotine Delivery Systems’ (e-cigarettes or vaping products to everyone else). The paper by WHO is for the 7th Conference of the Parties to WHO’s tobacco control treaty, the Framework Convention on Tobacco Control, (FCTC COP-7) which will be held in Delhi 7-12 November, 2016. A tremendous effort by the authors John Britton, Ann McNeill, Linda Bauld and Ilze Bogdanovica, and the reviewers (disclosure: I was a reviewer). The report speaks for itself, so here are the relevant links to the report, some unofficial translations and the executive summary. Please help to disseminate this report. Either send to your own contacts before or during COP-7 or if you have suggestions for relevant officials or influential people this could be sent to, please email me or directly or via the contact form and provide their name, title, institution and email address. I’m not chasing email addresses. These are available on an ‘as is’ basis – I am unable to vouch for the accuracy of the translation and they are not official UKCTAS documents. The text below is the executive summary from the UKCTAS report (i.e. not my summary). Please visit the links above to see the detailed criticisms behind these summary points. Positioning ENDS as a threat rather than opportunity. Overall, the WHO report does not correctly position ENDS primarily as an alternative to smoking and instead focusses excessively on risks of ENDS use without adequately recognising the deep reductions in health risks when a smoker switches to ENDS. The FCTC itself recognises ‘harm reduction’ as a key strategy in tobacco control. But with minor exceptions, the WHO report discusses ENDS as a threat, whereas in fact they represent a major opportunity for public health. Failure to quantify risk. The WHO paper provides a poor assessment of ENDS risks. In terms of toxicology, the discussion is naïve and places excessive emphasis on negligible risks arising from very low exposures. In toxicology, the presence of a potentially harmful agent does not necessarily establish a material risk. This is because the level of exposure matters and “the dose makes the poison”. Inadequate comparisons with smoking. The WHO paper does not systematically make meaningful comparisons with exposures arising from inhaling tobacco smoke or refer to other useful comparators such as occupational exposure limits. However, data from around the world shows that almost all ENDS users are smokers, ex-smokers or would-be smokers. The most relevant comparison for health policy purposes is with smoking. Misrepresenting second hand ENDS vapour risks. The section on risks of second-hand exposure to ENDS aerosol provides no evidence that such exposures pose any material risks to bystanders. The claim that ENDS have the “potential to lead to adverse health effects” in bystanders does not reflect the science behind the cited source unless ‘potential’ is taken to mean any exposure, no matter how trivial. Again, the issue is not the presence of particular chemicals, but the magnitude of exposure. Discounting the evidence that ENDS do help smokers quit. The WHO paper does not properly assess the role that ENDS play in quitting smoking and uncritically repeats a number of methodological errors found in the literature. Taking the totality of evidence including controlled trials, observational studies, changes in population smoking and ENDS use, the experience of nicotine replacement therapy, and widely reported user experience, there is confidence that ENDS are helping many smokers to quit smoking and not having negative effects like renormalising smoking, reducing quit rates or creating gateway effects. ENDS marketing can be anti-smoking advertising. The vast majority of ENDS marketing is truthful promotion of a low-risk alternative to smoking and targeted at adult smokers. The evidence cited by WHO has been misrepresented and does not make the case for any systematic malpractice by ENDS vendors. However, the WHO paper overlooks that most fundamental point, which is that ENDS marketing is promoting an alternative to smoking and may therefore be promoting desirable changes in smoking behaviour. It may also reach people who do not engage with conventional stop-smoking interventions. Flavours are essential to the appeal of ENDS as alternative to smoking. The section on ‘product characteristics’ attempts to demonstrate a problem with flavours appealing to teenagers. In fact, flavours are integral to the appeal of ENDS to adults as an alternative to smoking. The citations are selective and findings misinterpreted and do not support this claim. Several citations simply reflect opinions or speculation, while important studies have been overlooked. These do not show that any interest amongst teenagers in ENDS flavours is resulting in regular use of ENDS in this age group. Mischaracterisation of the ENDS market and role of tobacco transnationals. The WHO paper misinterprets the ENDS market, makes misleading and unreferenced statements about the role of transnational tobacco companies in the market and is not grounded in an understanding of how competitive markets function. WHO’s report fails to acknowledge the threat of disruptive technology such as ENDS to the commercial viability of the traditional cigarette business. Ironically, the only references given to published papers point out how regulations, such as those favoured by WHO, actually help the cigarette trade. WHO should be aware of the danger that its policy proposals may provide the traditional tobacco industry with a twin advantage: (1) slowing down the disruption of the cigarette market by ENDS; (2) shaping the ENDS market to suit the ENDS business model favoured by the tobacco industry. Unjustified support for ENDS prohibition. In the discussion of policy options, the opening paragraph for each policy set implicitly endorses ENDS prohibition. It does this by stating that “Parties that have not banned the importation, sale, and distribution of ENDS/ENNDS may consider the following options”. Prohibition is one regulatory option among many that ought to be discussed on its own merits, not taken as a default. The merits of prohibition are exceedingly poor given the pervasive availability of cigarettes in all jurisdictions. WHO should not be endorsing prohibitions, explicitly or implicitly. It is unethical to deny smokers much lower risk options than cigarettes, and there is no scientific support for ENDS prohibition as a public health intervention. The WHO’s framing suggests that a prohibition is something for Parties to progress towards and should not be undone once done. In fact, it is a policy that should be reversed. Policy proposals made with no supporting policy analysis. Numerous policies are proposed without any supporting evidence for their effectiveness or cost-effectiveness. Any policy proposal should be subject to evidence-based justification, options appraisal and analysis of trade-offs or distributional effects, and impact assessment. Policies should be tested for proportionality and possible unintended consequences. The WHO has not applied any policy-making disciplines to its menu of proposed policy options. Almost every policy listed in the WHO’s paper could easily have the effect of protecting the incumbent cigarette trade, promoting smoking rather than vaping, and lead to increases in non-communicable diseases. It is very likely that widespread uptake of WHO’s policy proposal would ‘reduce harm reduction’ and therefore increase harm. Transparency and quality. The WHO report has been made available without the four supporting papers upon which it is supposed to be based. These papers are still undergoing revision during peer review. This is poor scientific practice and does not provide a reliable basis for policy advice. This needs marketing and introduction into social conversations. Smokers care. Families of smokers care. Start a campaign. Get help with breaking down the important points for regular people to understand. Try Pinterest, YouTube and the like. Point them here, then things will happen. Most are not stupid or ignorant. Just like many other mostly public funded “health” organizations, they have a vested interest in keeping people smoking. Their jobs depend on it. However, they are certainly the latter three of the above. There are a few that are ignorant and alarmists – but only a tiny minority. Or are they also going to try and deny there are 2,500,000 vape users as well? Correct me if I’m wrong. I’m new at this harm reduction stuff, but keen, and hopefully with some semblance of common sense and objectivity. 2,500,000 x 29.8% = 745,000 vape users who’ve quit smoking cigs ? Or they they also going to try and deny there are 2,500,000 ex-smoker as well? Apologies if I’ve made an obvious noob error somewhere. I think the WHO needs to change the platform upon which it stands. It’s supposed to represent the promotion of health among the peoples of the earth from an unbiased viewpoint. This report heavily favours the tobacco industry and seems to take the position that they tacitly support it while vaguely refering to the benefits of vaping. I will not waste your blog space commenting on the disinformation spread by the farcical prohibitionist WHO in its secretive echo chamber COP meetings (a big waste of public money). Rather, a positive side effect of addressing this disinformation is the need to provide, in a single accessible document, a comprehensive summary of good quality scientific information and reasonable policy and marketing recommendations on e-cigs (sorry I hate techo-babble terms like “ENDS”). This has been well achieved by the UKCTAS report. Thanks for passing the message. This report should go to legislators along with a recommendation to switch the funding given to WHO to Doctors Without Borders instead. Well, Guy, I completely agree – the WHO indeed ARE stupid (they listen to Glantz); ignorant (they believe Glantz, Chapman et alia) and arrogant (they refuse to listen to opposing, better informed views). I am sure they will ignore thiscritique if they can, just as they have wilfully ignored other attempts to get them to see sense. They are under the sway of Big Pharma, it is clear. This report needs more publicity. Unfortunately, I (along with the vast majority of vapers and vape shop owners) am not in a position to arrange this. You need money, influence, or scary headlines to attract the press – science and truth doesn’t seem to count for much. The WHO may be predictable but they fail to realize the impact our voice is having on those who want the truth to be revealed. No stopping us now! Yep! We are fighting for our live. Thank you all for sharing and caring. If I may make a prediction? Notice taken by WHO of this report: None! It’s not about science, it’s about dogma and lining your pockets. 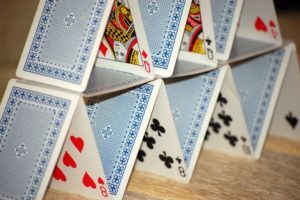 Speechless and overwhelmed with joy – the house of cards is collapsing – long live science, truth, objectivity and integrity! These charlatans need to be taught a lesson – this critique makes them appear stupid, ignorant, arrogant, false and deceitful!